Ohio Means Jobs Lake County and The Reserves Network are teaming for a job fair to help people find both temporary and long-term employment. The fair will be from 10 a.m. to noon on Friday, Jan. 17, at Mentor Public Library’s Main Branch. 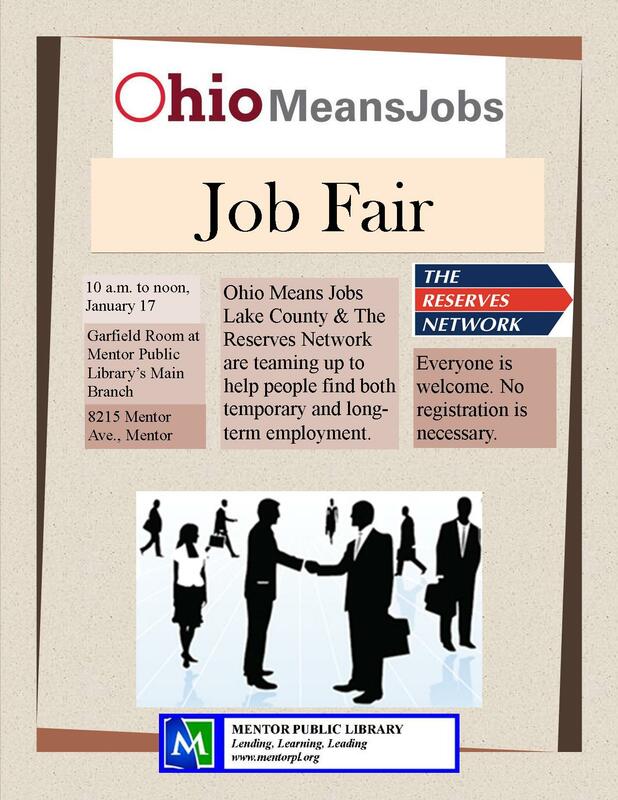 The Mentor branch of The Reserve Network helps match people to positions throughout Lake County and parts of Geauga County. Those positions from packing and assembly to machine operation and inspection. The Reserve Network has immediate needs for labor candidates with industrial skills, including CNC machinists, machine operators and assembly. General-labor positions are also available. The job fair is open to everyone and no registration is necessary. Job seekers should bring a resume and two forms of identification. They should also be professionally dressed and prepared to interview. With the aim of helping job seekers, Ohio Means Jobs Lake County has also partnered with Mentor Public Library to host a series of monthly career coffee talks at our Main Branch. The talks are designed to help people get the tools they need to help them find the career they want. The first talk will be from 10 to 11 a.m. on Thursday, Jan. 23. The speaker will be Charlene Long, the Talent Acquisition Specialist for Progressive. She’ll offer advice on what companies like Progressive are looking for in prospective employees. This talk is also free and open to the public. No registration is necessary. This entry was posted in Uncategorized and tagged career coffee talks, Job Fair, Mentor Public Library, Ohio Means Jobs Lake County, The Reserves Network. Bookmark the permalink.